BRIGHOUSE TOWN FC was formed in 1963. For the most part of their history, they played in the West Riding County Amateur League. In 2008 they applied to join the NCEL Division 1 and after they were accepted they joined for the following season. The first year was a season of consolidation as they finished 15th. Things improved for the better in 2009/10 and a second-placed finish behind Tadcaster Albion was enough to see them promoted to the NCEL Premier. Again they used the first season to find their feet, finishing in 16th but after coming 4th the next season they were just pipped to promotion by Scarborough Athletic. They soon put their disappointment behind them, winning the league in 2013-14 and for the following season, they joined the NPL D1 North. A 14th placed finish last season represented steady progression. The Championship season in the NCEL Premier also saw their best ever FA Cup run. Starting in the Extra Preliminary Round they beat Seaham Red Star 3-1. It was North East opposition again in the Preliminary Round and Billingham Synthonia were beaten in a replay. For the third consecutive game, they played North East opposition, this time defeating Crook Town 4-1 at home. This set up a tie against Stockport County, a fallen giant who had not 10 years ago been challenging for Championship football. Onset travelled to Edgeley Park and were unlucky to come away with a 1-0 defeat to the Conference North side. 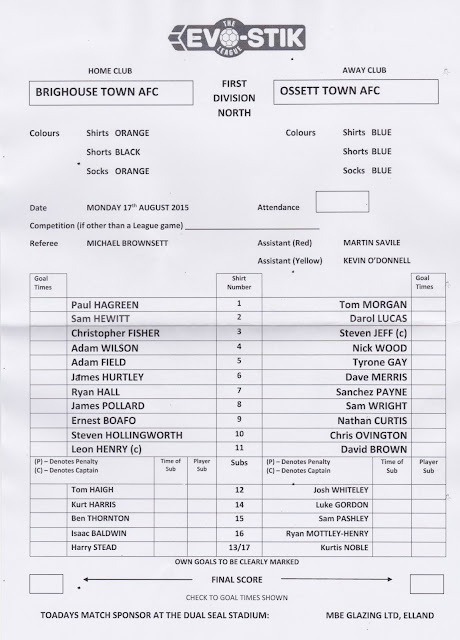 Brighouse lost their only tie in the FA Trophy, going down 1-0 to tonight’s opponents Ossett Town. A good run in the FA Vase ensued in 2012/13. After beating Hall Road Rangers, Staveley Miners Welfare & Holbrook Sports they faced a trip by plane. Sadly for them, Newport IOW triumphed 2-1 on the island and ended their dreams just when Wembley was coming into sight. Local cup wins have come in the West Riding County Cup and the Halifax FA Cup. Originally I was undecided about whether I was going to go away on the Monday of my trip. Football options are usually a bit limited, plus it’s one of the better nights for TV. But then I got details of a Travelodge offer, which meant I could get a hotel for the night for £22. It had its own bathroom which a lot of the cheaper places I stay at don’t. Plus with 24-hour check in, I needn’t worry about going to check in before the game. There were 3 options on the night for grounds that I’d not been to. Widnes Vikings and Daisy Hill were at home in North West Counties League action, but I was hoping to do a step 5 or 6 ground on Wednesday for an FA Cup replay. 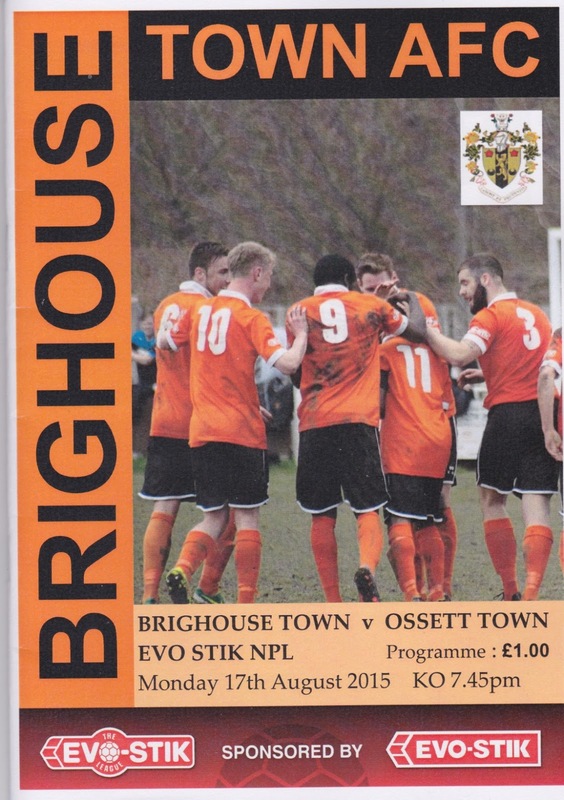 So I settled on the local derby between Brighouse Town & Ossett Town in the NPL D1 North. It had the bonus of having a fair sized town nearby and the ground was only a short walk away meaning I’d have a decent choice for dinner. Later on in the week, my mate Anders announced he would be coming all the way from Norway and another mate David said he might pop over from Liversedge, which is slightly closer. On the day of the game, I awoke after a restless nights sleep just after 6am. I spent the first hour or so listening to the radio while sorting out some old computer games to sell on eBay. After this week away and my car insurance also due for renewal, I needed to make some money back and those will be listed upon my return. I was cheered up when I looked at the ‘Non-League Matters’ forum to see that various FA Cup ties were being moved to Friday and Sunday. With me being at Crawley Town v Wycombe Wanderers on the day of the Preliminary Round, and also having missed out on a replay this coming week, I was glad that I’d be seeing some cup action. I had a bath around 9 and spent the rest of the morning researching and packing for my trip. As with yesterday I was getting restless and struggling to kill time before my trip away. In the end, I decided to stay at home with my creature comforts as I didn’t want to get there too early. That said, you never know what the roads are going to throw up and with a clear run I’d be getting up to Yorkshire with around 3 hours to spare. After a bit of lunch, I left home around 12.45. The journey up was not bad. The pathetic 50mph limit was in force for about 70 miles of the M1 but I kept going. I got to Brighouse around 4.25. After parking up I was surprised to see it was 2 miles into town as I'd reckoned on less than a mile judging from the 'What Pub' website. But they quoted distances as the crow flies, rather than taking into account the winding Yorkshire roads. Luckily I had bags of time to kill and didn't mind a walk. About 5 I arrived at the Wetherspoons in the town, called The Richard Oastler. It turned out to be a great pub and probably the best Wetherspoons I have been to. 4 boxed ciders were on offer and I chose Waddlegoose Lane King Harry. I was hungry by that point and so ordered some of their 'Mexican Monday' food. 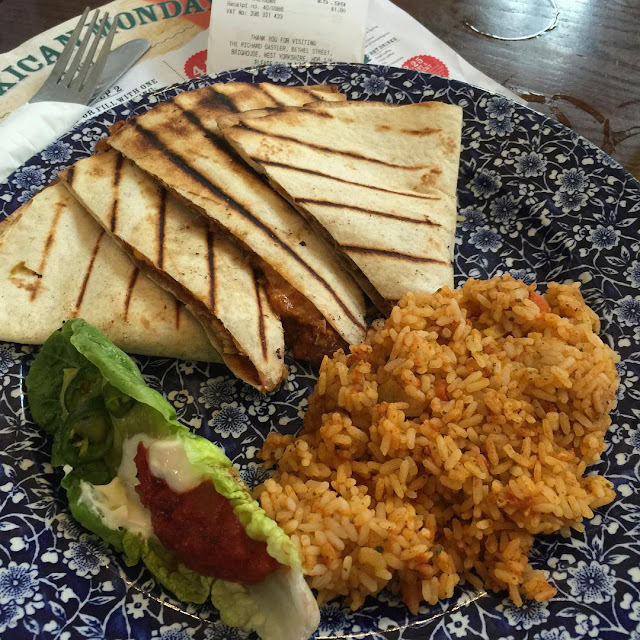 A Quesadilla was the order of the day and very good it was too, coming in at £6 with a pint of Thatchers Gold included. By then it was getting on for 6 and after seeing a number of people with Sainsbury's bags I navigated there as I still needed a toothbrush. I also bought some grapes and some Belgian Buns before walking back to the ground. It was up hill and down dale back to the ground but at least I burned a few calories of my dinner off. I eventually got back to the ground at 7. After getting my stuff from my car I made my way to the ground. Entry and programme was decent value at £8 combined. I bumped into to Leicester Alan again who had been at Knaphill on Saturday and he had also bought along Lesta Blew Hopper. I went into the clubhouse to sit down and read my programme. As soon as I was in there I saw Norwegian hopper Anders and he had come along with a Rotherham supporter called Brenden. We all got along fine, chatting for most of the game. Completing the meets was Bradley who had very kindly bought along an NPL Facebook group shirt for me. We only chatted briefly but it was nice to meet another great footy fan. As with my previous 3 games at the weekend, there was an early goal. It was a low shot from David Brown that gave Ossett the lead and they pretty much controlled the first half. Despite this Brighouse got an equaliser on 36 minutes through Steve Hollingworth. He scored with a simple finish. It was all level at the break but Brighouse had a much better second half. It was right in the final minute but it was the visitors who got it. It came via a breakaway after a spell of Brighouse pressure. It was a header from Nathan Curtis deep into injury time that won it and as tempers flared the home side had a player sent off in the dying moments. The Monday night football experiment had paid off with 279 fans turning up - way above their usual average and it's a shame more clubs don't change from the packed Tuesday schedule. After the game, I said my goodbyes and went back to the car. Roadworks slightly delayed me slightly as there was a reduced speed limit for most of the way. Even so, I still got to the Travelodge in Salford Quays just after 10.30. After checking in I decided against stopping at the bar for a drink. Instead, I went up to my room and caught up online. After that, I watched some videos on Youtube before going to sleep just before 1am. ST GILES ROAD is one of the more basic step 4 grounds. There is only one stand, holding a few hundred with a combination of sitting and standing. The rest of the ground is open terracing and hard standing. Visitors are made to feel very welcome and prices are very reasonable too. The clubhouse offers a basic range of drinks and there is also a range of hot food and soft drinks. There were badges, ski hats and old programmes for sale too. The town is a 2 mile walk away but is pleasant enough with a decent range of eating and drinking outlets.